Ani’s sweet potato haupia pie. Doesn’t it just make you drool? A buttery crust of macadamia nuts in each bite. A decadent filling of Okinawan sweet potatoes that almost melts in your mouth. A soft layer of perfectly textured haupia with that wonderful coconut flavor. Topped off with the most divine whipped cream to ever touch your tongue. Heaven in Hawaii? I think so. If you’re a pie lover and on Oahu, head to Ani’s Bake Shop at least once (I’m already planning my second visit). Birthday girl cutting her pie. Yesterday was Mom’s birthday so I decided to leave a little early to check out Ani’s Bake Shop. I’d heard plenty of good things about this hole-in-the-wall bakery and it was the perfect day for something special. Unfortunately, despite waking up earlier than usual, in typical Amy fashion I still left the house only 15 minutes earlier. With the unexpected heavy traffic and getting lost, that left me only 9 minutes to look around! If I wasn’t panicking before, I certainly was now since I was worrying if I would get to work on time – I could feel the adrenaline rush as I halted my way down the red stop lights. But truthfully I didn’t have to worry. Ani’s Bake Shop is tiny and the average person only spends 10 minutes in here. In fact, you may go in there and be surprised by how many pies, pastries and breads they’re able to cram in there. Local Tip: Get there in the morning to have a variety of choices. I was there around 8:15 AM on a Friday and most of the shelves were still filled – although I did notice a few flavors that were totally sold out! The cashier also mentioned that Fridays were usually busier so plan an early morning visit if you’ve got a weekend event. It only takes 5 steps from the front door to the end of the display area and you’re immediately bombarded with fantasies of flavors. Names like Pumpkin Crunch and Guava Butter roll off your tongue and it’s so hard to not salivate! There’s also proof of Ani’s local fame framed right next to you while you pay the cashier. The article is a beautiful one that will make you smile, which you can read here. Local Tip: The Portugese sweet bread and bread with fruit filling are the big sellers. These are definitely on my list for my next visit. Check out that bottom right picture! Maybe one day they'll let me see them in action! 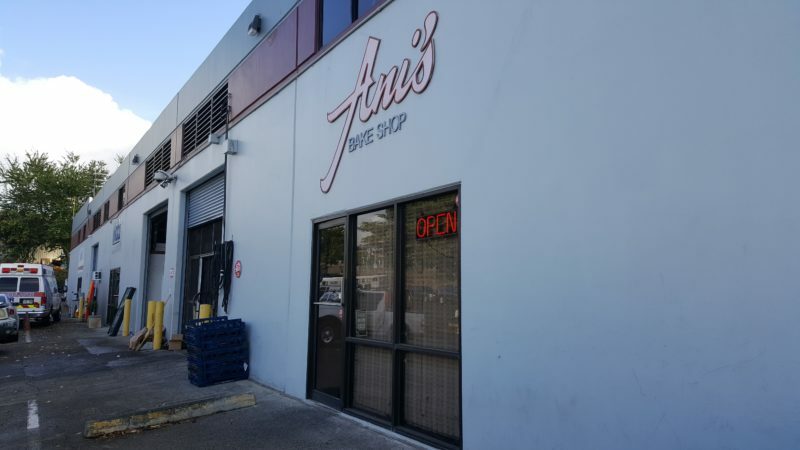 Ani’s Bake Shop can be difficult to find if you’re not familiar with the area. I suggest setting your GPS and listening carefully to the directions for your first visit. The roads near the shop have a strange curve to them and one wrong turn will force you right back onto the freeway in the opposite direction. Spoken from experience – to get to work on time and out of the wrong lane I was in I made an illegal turn. Whoops! The shop itself is in the middle of a small industrial area and is really out of place at first glance. There are only a few parking spaces designated for Ani’s customers, so make sure you park in the right one (they’re all labeled). Local Tip: They take phone orders so order in advance if you can’t get there early in the morning. I’ll be getting their Pumpkin Crunch Pie this Thanksgiving! So what did I end up getting for this special birthday occasion? I had to do a lot of research on this. Everyone has their favorite pie flavors and I was tempted to try out the Pumpkin Crunch (I love pumpkin pies). But, since this was a pie for my Mom, I went with their most popular pie: sweet potato haupia pie. The flavors blend in so well together and each bite is pretty close to perfection. The macadamia nut crust spreads out as you chew and the haupia filling has a good coconut flavor that adds a pudding-like texture. 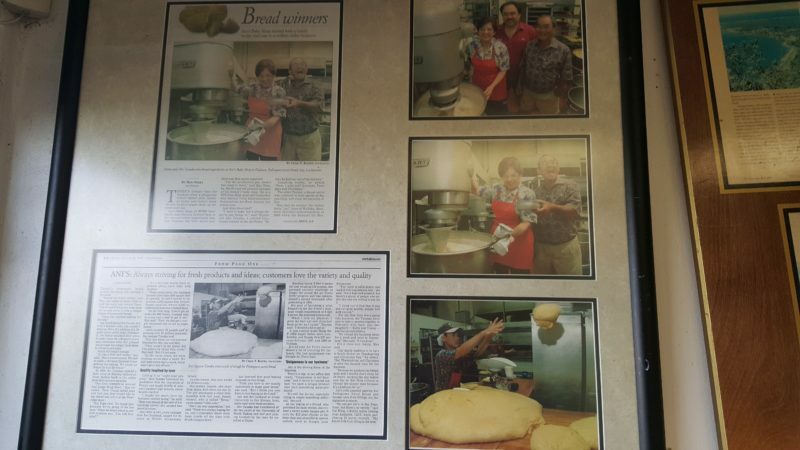 Local Tip: Know who else does their macadamia nuts well? Koa Pancake House. Click for macadamia nut pancakes with coconut syrup! The best thing I liked about this cake was the sweet potato filling. I’m usually wary of sweet potato fillings because they can be too dense and heavy more than tasty. Sometimes they can also run a little on the dry side. Ani’s sweet potato filling recipe is on point. The filling may be heavy, but it’s heavy because there’s so much of it. It’s very moist and soft and the flavor of sweet potatoes stays true to the pie rather than being just sweet. Is this pie for everybody? 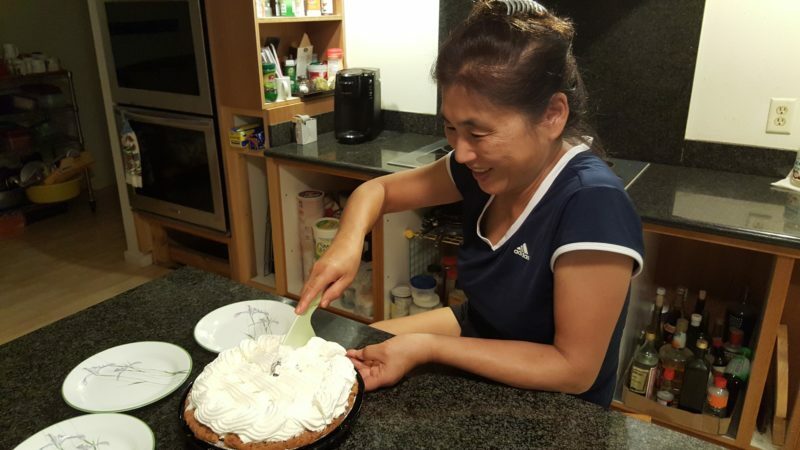 Unfortunately, Mom could only take a few bites of her slice because it was too rich for her. Ani’s Bake Shop and fans shouldn’t despair though – Mom has the most sensitive stomach ever and does this with a lot of food and desserts. Cute side story: On Mom and Dad’s first date to Baskin Robbins, Mom asked if she could throw away her ice cream. Oh, the horror! But the pie was a hit for the rest of us. In fact, I snuck in a slice this morning for breakfast and noticed that someone else had dug in before me. Now more than half of the pie is missing. 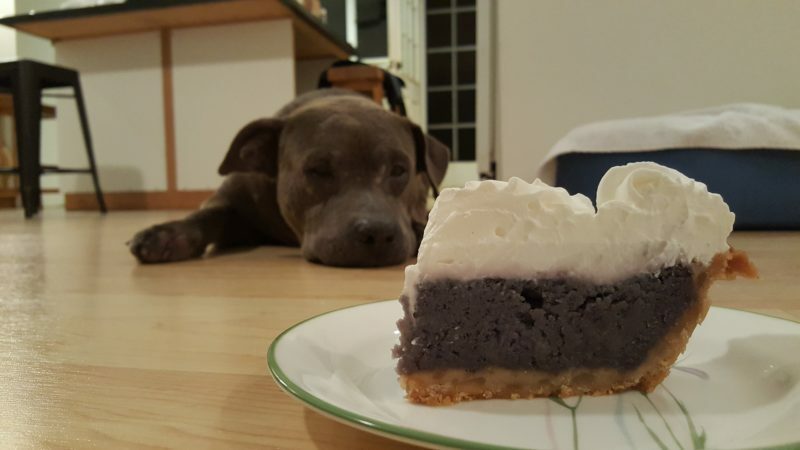 Even Daisy the dog had her eyes on the pie! Too bad, Daisy!